« Pet’s love robots too ! They’re Heeeeeeere! RoboBuilder has Arrived! The RoboBuilder kits have arrived !! You can find them in the catalog in the Humanoids section or the Full Robotics Systems section. RoboBuilder is the new building block robot kit on the scene. Designed for robot enthusiasts and education alike RoboBuilder hits a sweet spot with feature packed kits at great prices. Its designers focused on form as much as function and the result is a great looking robot. The 5720T kit even sports translucent plastic with multicolored internal LEDs. You could take this little guy to the rave with you on the weekends! Don’t let the streamlined good looks of RoboBuilder fool you. Beneath all that flash lurks plenty of substance. RoboBuilder is packed with advanced features not found on many of the other kits in the market such as: Precise PID Motion Control, distance detection, sound detection & speaker system, IR remote control included, Bluetooth upgradeable, and full-duplex drop-down UART serial communication on the smart actuators. A common complaint in robotics is that too much time is often spent building robots and not enough is spent enjoying them. RoboBuilder solves this problem with their unique quick assembly joints which make assembly and design changes a breeze. Building is so easy that a complete humanoid takes less than two hours to assemble. Once the robot is built there are multiple easy to use software interfaces to play with- WCK Programmer, Motion Builder, Action Builder, & Diagnostics Interface. RoboBuilder is ready to move as soon as it is assembled and using the software you can program your own humanoid motions in just 10 minutes. Another exciting feature is the ability to trade motion files on the internet uploading your own and downloading others. RoboBuilder is not only powerful, it’s affordable. You can choose from four kits priced at: $420, $680, $860, and $1,560. The RoboBuilder kits are manufactured by RoboBuilder, LTD a Korean company: www.RoboBuilder.net. RoboBuilder is distributed by Trossen Robotics, LLC. More information about RoboBuilder can be found on the website: www.TrossenRobotics.com, 877-898-1005. Interested resellers are invited to contact them for more information. 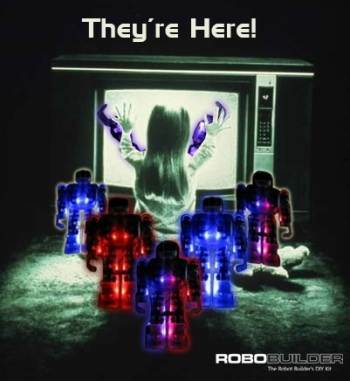 Download the RoboBuilder Brochure here. Interested resellers may call or email us for further information. This entry was posted on Monday, July 28th, 2008 at 1:18 pm	and is filed under Announcements, Front Page News, New Kits / Products. You can follow any responses to this entry through the RSS 2.0 feed. You can leave a response, or trackback from your own site.